There will be two of them. Here we are picking out fabric colors (I gave her a choice between to reds... the $3 a yard red and the $20+ a yard red... can you guess which one she picked? I was hoping she'd pick the $3 satin over the $20 dupioni silk... but she apparently has expensive taste... thankfully the project only requires a tiny bit of red!). Snow White! I can't wait to see the finished dress. The blue fabric is very pretty. Is it a Snow White Dress? I am excited to see the finished product! 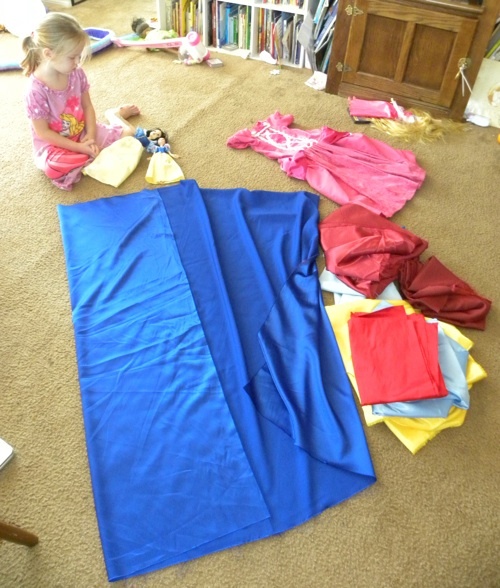 Lol, you are making Mae Babe a Snow White dress. What a good big sister. Looking at the colours involved, and drawing upon my massively-spotty memory of Disney Princesses, I'm going to guess Sleeping Beauty. Or Snow White, since I always get them confused. If you wanted to be devious, you could make one of each: one for mae and one for Sadie. Well, my first thought was a "Mary Dress" since the blue fabric is so prominent in the picture but I also see Sadie contemplating the princess dolls (Snow White, I think), so my official guess is a Snow White Princess Dress. You are such a good momma.